Dan Pariachi and Madhu Mala receive their Award from Michelle Malcolm of Crowe Horwath (left). 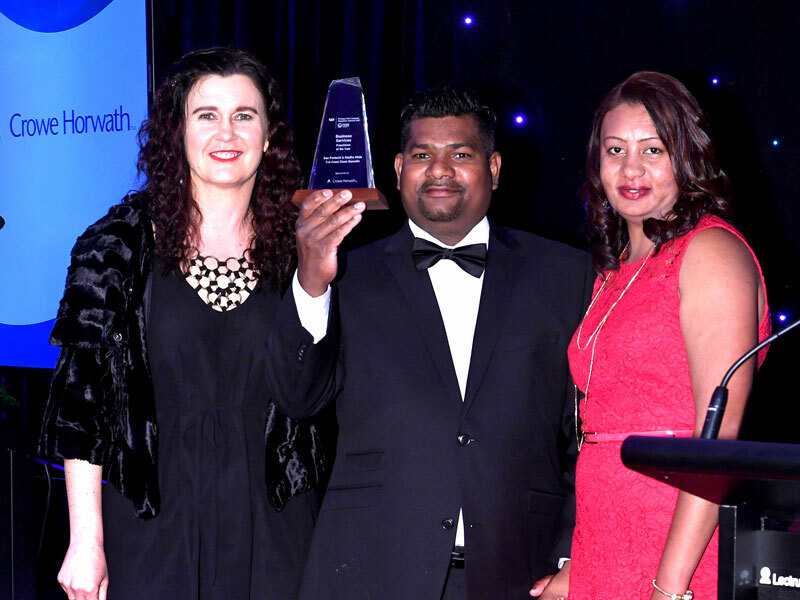 CrestClean business owners Dan Pariachi and Madhu Mala have scooped a major award at an annual event that recognises excellence in New Zealand’s franchise sector. The Dunedin couple are national winners in the Business Services category of the Westpac New Zealand Franchise Awards. It’s a remarkable achievement for the husband and wife team, who arrived in New Zealand nine years ago with just their suitcases and $200 between them. The couple, who have increased the turnover of their CrestClean business tenfold and employ six staff members, won high praise from the awards judges. They were commended for their customer focus and the delivery of the services they supply. Dan says they were stunned and overcome when the winners were announced at a gala awards dinner at Auckland’s Alexandra Park on Saturday. CrestClean colleagues at the awards dinner were the first to congratulate Dan and Madhu. Among them were CrestClean’s Dunedin Regional Managers Tony Kramers and his wife Nicky. “As soon as we came back to our table Tony and Nicky hugged us and said ‘we are so proud of you guys’,” added Dan. CrestClean Managing Director Grant McLauchlan said Dan and Madhu’s award is inspirational and an endorsement of how the company’s business model is changing lives of franchisees throughout the country. “Like Dan and Madhu, our people are running very successful businesses and enjoying the personal benefits such as being able to buy their own home, which is a major achievement in itself. Dan and Madhu immigrated to New Zealand from Fiji in 2008, but starting a family meant they struggled on a single income. Dan says it got really tough – after rent and paying off a loan, they were left with just $47 dollars a week to live on. The family moved to Dunedin and Dan got work fitting windscreens. Meanwhile, Madhu looked for a business that offered additional income with flexible working hours. She joined CrestClean in 2013 and Dan joined her the following year after he got made redundant. He says they worked 24/7 to make ends meet. Their initial hard work paid off and they were able to start looking for a house within 18 months – a previously unimaginable dream. Earlier this year, Dan was appointed an Assessor for the Master Cleaners Training Institute, CrestClean’s in-house training arm. The couple were commended by awards judges who said: “CrestClean Dunedin impresses with its challenging target-setting, and reaching those targets by focusing on customers and people. The Westpac New Zealand Franchise Awards are promoted by the Franchise Association of New Zealand. Entry is only open to its members. The acclaimed awards are recognised as having some of the most rigorous criteria in the world. Entrants go through a comprehensive four-stage process. Evaluations by the New Zealand Business Excellence Foundation are based on the internationally-recognised Malcolm Baldrige criteria, a system that is used by more than 25 countries as a standard for quality awards. New Zealand’s franchise sector turns over $27.6 billion and has 37,000 franchise units – that’s one unit per 124 Kiwis. Copyright 2016 Crest Commercial Cleaning Ltd - All Rights Reserved. Visit our customer website to get a cleaning quote. CrestTalk, Product Ordering and Resources.